Each week the Kpreps Friday Fresh Take is brought to you by Subway. 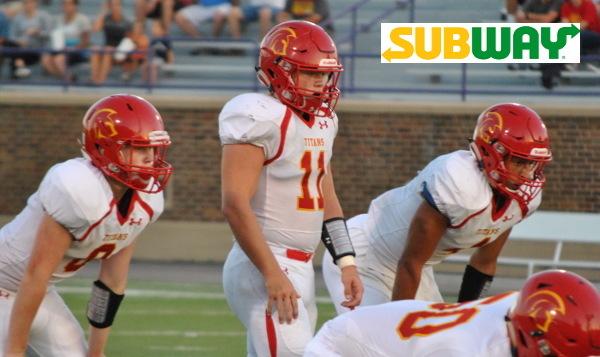 Remember, when you visit Subway this weekend, please thank them for their continued support of Kansas high school football and Kpreps.com. Pike Valley scored on a 14-yard touchdown pass from DeVante Hammer to Lane Peters on a fourth-and-8 play with 1:54 remaining to overtake Osborne, 30-28. The Panthers’ Anton Reeves then intercepted Osborne’s last-second heave into the end zone to secure the win and end Osborne’s state-best, 16-game winning streak. For a while it looked as if the defending 8-Man, Division I champions were going to take control of this game. Osborne, ranked No. 2 in 8M-I, led 14-6 at halftime on a pair of Darnell Holloway touchdown runs. That lead grew to 20-6 in the third quarter on Holloway’s third touchdown run. Late in the third quarter, Hammer hit Heath White on a short touchdown pass to pull Pike Valley within 20-12. Holloway would answer right back for Osborne and give the Bulldogs a 28-12 lead heading into the fourth quarter. After a long pass play deep into Osborne territory, Cole Strickler caught a Hammer touchdown pass to pull the Panthers within 28-18. Hammer would then add a 15-yard touchdown run mid-way through to fourth quarter to cut Osborne’s lead to four, 28-24. That set up the late Hammer to Peters connection to give Pike Valley the lead with under two minutes to go. Last season, Osborne held off Pike Valley 34-32 thanks to the Bulldog defense thwarting four of five Panther two-point conversions. Like Friday, Pike Valley scored last in last year’s game, but Peters was stopped short of the goal line on the two-point attempt and Osborne held on for the two-point win. On Friday, Pike Valley, No. 2 in 8M-II, went 0 for 5 on two-point attempts, but still came away with the two-point win. Buhler beat a ranked opponent for a second consecutive week as the No. 5 Crusaders topped the No. 2 Maize South Mavericks, 17-14. Buhler built a 17-0 lead in the second quarter, then avoided give up the lead in the second half despite three fumbles. Jhett Burkhart followed up a Braden Rose field goal with a touchdown run for a 10-0 lead in the second quarter. Dalton Brown then broke a 43-yard touchdown run to put Buhler up 17-0 in the second quarter against a Maize South team that had not given up a point all season entering Friday’s game. Brown rushed for 158 yards to lead Buhler. Maize South scored once in the second quarter and once in the fourth, but couldn’t get any closer. The Mavericks managed only 52 yards rushing and 192 total yards in the game. In a battle of top five teams, Class 6A No. 5 Blue Valley dominated Class 5A No. 5 Mill Valley 49-9 on Friday to improve to 3-1 on the season. Blue Valley took an early 7-0 lead on a touchdown pass from Luke Bernard to Cameron Green, but Mill Valley’s Cameron Young returned the ensuing kickoff 95 yards for a touchdown to pull the Jaguars within 7-6. That’s as close as the Jaguars would get. The Tigers would score three more times in the first quarter to build a 28-6 lead thanks to a Blake Brown touchdown, a pick-6 by Shane Bergeman, and an Eric Olson touchdown reception from Walker Kinney. After a Mill Valley field goal, Bernard would connect with Bergeman on a touchdown pass in the second quarter to extend the lead to 35-9. Blue Valley would tack on two more touchdowns in the final 1:30 of the first half, both following interceptions of Jaguar quarterback Brody Flaming. Olson broke free for an 85-yard touchdown after one Mill Valley turnover, and Alex Totta added the second touchdown with less than 30 seconds in the half. The Tigers led 49-9 at halftime and that score held throughout the second half. Class 4A, Division II’s top-ranked Columbus Titans used a 99-yard touchdown drive in the fourth quarter to escape Hutchinson Field with a 23-8 win over St. Mary’s Colgan. Leading 16-8 in the fourth quarter, Columbus stopped Colgan on third down just outside the goal line. On fourth down, the Titan defense jarred the ball loose from Panther freshman fullback Domenico Bevilacqua which was recovered by Colgan in the end zone, however, the officials awarded Columbus the ball inside their own 1-yard line. Columbus then executed a 15-play, 99-yard drive that ended with a 5-yard Ridge Smith touchdown run to push the Titan lead to 23-8 with 1:36 remaining. The Titans got on the board first mid-way through the first quarter when Zach Porter caught a Panther fumble in the air and returned it 15-yards for a touchdown and an 8-0 lead. Colgan’s defense would respond late in the first quarter as Cal Marquardt picked-off a Smith pass and returned it 30-yards for a score. Marquardt had trouble handling the snap on the PAT, but alertly scrambled towards the right corner to tie the game at 8. Columbus would take the lead for good on a 1-yard touchdown run by Smith on 4th-and-goal with 2:55 left until halftime. Colgan would reach the Columbus 9-yard line before halftime, but Luke Orender’s 24-yard field goal hit the right upright and fell away. Derby shut out Hutchinson 32-0 in the second half on Friday to roll to a 61-18 win over the previously-unbeaten Salthawks. Hutchinson played well early and led 18-15 late in the first quarter, but a Brody Kooser touchdown run put the Panthers on top 22-18. Beforehalftime, Hutchinson drove into Derby territory, but Jacob Ormsby picked up a Salthawk fumble and returned 65 yards for a touchdown and a 29-18 halftime lead. Kooser then took his first carry of the second half to pay dirt for a 36-18 lead. The senior back finished with 185 yards rushing on only nine carries and scored three touchdowns. Quarterback Grant Adler rushed for 77 yards and a score, and passed for nearly 150 yards and two more touchdowns to Tyler Brown. Brown finished with three receptions for 130 yards and two scores. Smith Center improved to 3-1 and made a statement in the Mid-Continent League with a 43-0 blowout of Norton. The Redmen led 15-0 after one quarter and 29-0 at halftime. Smith Center scored twice more in the third quarter to completed the scoring. Smith Center beat Norton 20-17 in overtime last season, and have won the last three times in the series. Pawnee Heights won the rematch of last seasons’ inaugural 6-Man championship with a 51-6 thrashing of Weskan. Junior back Kade Scott led the Tigers with 237 yards rushing and scored five touchdowns in the game. Scott now has more than 650 yards rushing and 15 touchdowns this season. Pawnee Heights ended Weskan’s 11-game winning streak. Two of those Coyote wins came against Pawnee Heights last season; 36-25 during the regular season and 36-18 in the 6-Man championship game. The Manhattan defense did what many thought to be impossible; they shut down Topeka High sophomore running back Ky Thomas en route to a 21-14 win over the Trojans. Meanwhile, the Indians produced a consistent run game against the Trojan defense that resulted in more than 300 yards rushing. Kevontae McDonald led the way in rushing for more than 200 yards and two touchdowns on the night. Manhattan scored on a McDonald touchdown run and a pair of Thomas Gevock field goals to lead 13-7 at halftime. The lead extended to 21-7 in the third quarter on McDonald’s second touchdowns. Both Topeka High scores came on touchdown passes from Da’Vonshai Harden to Larry White. Mulvane scored 28 unanswered points on Friday to defeat Wichita Collegiate for a second consecutive season. The Wildcats scored touchdowns in the third and fourth quarters and shut out the Spartans in the second half en route to the 35-19 win. After taking a 7-0 lead Mulvane fell behind 19-7 after three touchdown passes by Collegiate quarterback Cody McNerney. The Wildcats would answer on a second touchdown pass from Jayden Price to Drew Ellis to pull within 19-14. Shortly after, Mulvane would cover a Collegiate fumble at the Spartan 5-yard line and score on a short touchdown run by Price to take a 21-19 lead into halftime. Mitchell Lady scored on a 29-yard touchdown run with under three minutes left to play to propel Shawnee Heights to a 21-14 victory over Topeka Seaman. The Vikings would respond with a drive inside the Shawnee Heights 10-yard line late in the game, but could not connect on four passes to the end zone. Shawnee Heights overcame four fumbles in the game, including a costly one inside the Seaman 30-yard line late in the fourth quarter. Shortly after the turnover, however, Heights’ Cooper Finnecum intercepted a Seaman pass to set up Lady’s go-ahead score. Trey Jenkins led the T-Birds with 177 yards on the ground including the game’s first score on a short run in the second quarter. Seaman tied the game at 7 at halftime and took a 14-7 lead in the third quarter on a 19-yard run by Janson Garman after a Shawnee Heights fumble. Lady tied the game on a touchdown run late in the third quarter. He finished with 75 yards on the ground and two touchdowns. Both the Thunderbirds and the Vikings entered Friday’s game unbeaten at 3-0. In another Central Prairie League showdown, Otis-Bison held off Victoria 22-20 to improve to 3-1 on the season. Both teams entered Friday’s matchup ranked in Kpreps top five in their respective classifications, Otis-Bison at No. 5 in 8M-II and Victoria at No. 5 in 8M-I. The game was tied at 14 at halftime before the Cougars took a 22-14 lead mid-way through the third quarter. Victoria would get back on the board with under three minutes left in the game, but the Cougars stopped the Knights two-point run to preserve the lead and the win. KC Schlagle remained unbeaten with a 56-8 thrashing of KC Washington on Friday night. A year after giving up 361 rushing yards and four touchdowns to Cornelius Ruff, the Washington Wildcats allowed Schlagle’s Ivan Webb to break free for 378 yards and seven scores on Friday night. Webb entered Friday’s game needing just 144 yards to eclipse the 1,000-yard mark for the season. After his performance on Friday, Webb (6-0, 200) now has 1,234 yards in just four games for an average of 308.5 yards per game. Schlagle looks almost certain to run the table in the regular season and be in contention of the No. 1 seed on the east side of Class 5A again this season. The Stallions were seeded No. 1 in the 2016 playoffs and escaped an upset bid by No. 16 Topeka Highland Park (24-16) before falling to St. James Academy 53-17 in the second round. Entering Friday four teams in the state had not allowed a point through three weeks of the season. Now only one remains. Basehor-Linwood shut out Independence 50-0 on Friday leaving the Bobcats as the only Kansas team yet to allow a point this season. Maize South, South Barber, and Hoxie were the other three teams that entered Friday without allowing a point, and only Hoxie remained unbeaten out of that group. The Indians picked up a huge district win, 22-6, over Atwood-Rawlins County in the Kpreps Fan’s Choice for Game of the Week. Meanwhile, Maize South dropped a 17-14 decision to Buhler and South Barber was beaten by Argonia-Attica, 34-30. Pike Valley, Osborne, Buhler, Maize South, Blue Valley Mill Valley, Columbus, St. Marys Colgan, Derby, Hutchinson, Smith Center, Norton, Pawnee Heights, Weskan, Manhattan, Topeka High, Mulvane, Wichita Collegiate, Shawnee Heights, Topeka Seaman, Otis-Bison, Victoria, KC Schlagle, KC Washington, Basehor-Linwood, Independence, South Barber, Argonia-Attica, Hoxie, Atwood-Rawlins Co.